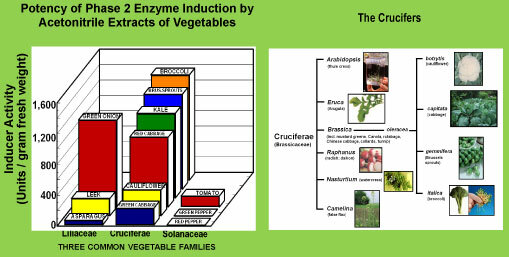 We showed that the cruciferous vegetables (also known as crucifers, coles or mustards), reigned supreme in their ability to induce cytoprotective or Phase 2 detoxication enzymes (left. This fact has now been borne out by over two decades of research worldwide. Some representative crucifers are depicted in the panel on the right. It was from 640 grams of a specific cultivar (variety) of broccoli, that we ultimately isolated a few milligrams of sulforaphane (in 1992), demonstrated its remarkable potency in inducing the phase 2 enzymes in mammalian cells, and showed that it prevented cancer in rats (1994). Our discovery of sulforaphane in 1992 was the opening salvo in our new strategy in the battle against cancer. Isolated from broccoli it is the principal and very potent inducer of a group of enzymes that protects cells against a variety of damage. We developed a chemical assay for isothiocyanates and their metabolites in urine, blood, and tissue, and a rapid assay for the boosting of cytoprotective enzymes. Both assays have become invaluable in executing our strategy, and both of them are now in widespread use worldwide. We then found that sulforaphane blocked the formation of mammary tumors in rats treated with a potent carcinogen. These exciting results provided important confirmation that new, naturally-occurring tumor-blocking agents could be identified in edible plants by screening for inducers of detoxication enzymes. The isolation of sulforaphane sparked intense and ever-growing interest that individuals can exercise control over their own risk of developing cancer.